Turkey is currently embroiled in a heated domestic debate about transitioning from a parliamentary system to a presidential system.There are deep divisions among both Turkey’s political class and different segments of society about the proposed political system and constitutional change. In this article, the author lays out the reasons behind the AK Party’s push for establishing an executive presidency, the opposition parties’ positions vis-a-vis this change, and the different dimensions of the constitutional and governmental changes. He concludes by asserting that a presidential system with checks and balances will be the key to ensuring Turkey’s long-term stability and democratic character. A close observer of Turkish politics will easily recognize that Turkish democracy has in practice slowly evolved to resemble the semi-presidential system of France. Although it has been a pioneer among developing countries in terms of its experience with constitutionalism and democracy, the Turkish political elite are still discussing what the best form of government is for Turkey. One of the central issues is whether the American type of presidential system, the French type of semi-presidentialism, or the parliamentarism based on the British model will be better at meeting the expectations of the people for a better democracy, rule of law, political stability, and administrative efficiency. The ruling Justice and Development Party (AK Party) government has been pushing for a presidential system since its establishment, and Recep Tayyip Erdoğan, its founding leader and now President of the Republic since August 2014, firmly believes that the best way to ensure democratic stability in Turkey is to rewrite the Turkish military-made 1982 Constitution and implement a well-defined presidential system. However, some segments of society and the political class of Turkey including the Republican People’s Party (CHP), the left-leaning main opposition party, categorically reject presidentialism and argue that it will only make Turkey an authoritarian regime, not a better democracy. Therefore, they support a revision of the current constitution, but demand that the basic structure of the existing governmental system, which is based on parliamentarism, remain intact. The public at large seems to be divided almost in half, and the media discusses the pros and cons of the different models of democratic governments around the world almost every day. What is needed in Turkey at this critical conjuncture of its history is an all-inclusive, constructive, and informed public debate that no responsible political actor should be exempt from participating in. A close observer of Turkish politics, however, will easily recognize that Turkish democracy has in practice slowly evolved to resemble the semi-presidential system of France, marked by the first ever election of the president by the popular vote in 2014. The strong powers and prerogatives granted by the Turkish 1982 Constitution to the president of the Republic, combined with resilient popular support and his charismatic leadership style have indeed put Erdoğan in a de facto presidential position. Therefore, many of the political scientists who specialize in governmental systems would be hard pressed to classify the current Turkish system under the heading of parliamentarism anymore. The reason is simple. Despite the defined elements of the parliamentary system in the current constitution from a comparative political perspective, such as appointment of the cabinet and the requirement of a confidence vote from the parliament, the functioning of the system is very different from that of a parliamentary democracy and is perhaps closer to semi-presidentialism. This reality indeed creates serious confusion among the public at large, fuels a very loaded political discussion, and constitutes political anomaly at a systemic level that calls for an urgent political debate on needed reforms in order to overcome potential constitutional crises in the future. What is needed in Turkey at this critical conjuncture of its history is an all-inclusive, constructive, and informed public debate that no responsible political actor should be exempt from participating in. I will further discuss the different dimensions of the constitutional and governmental changes in Turkey today and evaluate the position of opposing political actors. Why Should Turkey Discuss a New Constitution and a New Governmental Model? Some observers from outside the country may find it confusing that Turks endlessly debate high-level political issues such as constitutional amendments, occasional military coups, and changing governmental models. These issues have been on the Turkish political agenda for a long time for some obvious reasons. First, the roots of the debate go back to late Ottoman era simply because of the fact that when the powerful armies of the Sultans were defeated in battles with mostly western armies, the political elite began looking for ways to reform the army, bureaucracy, and finally the monarchical system itself. The resulting anxiety for the future of the Ottoman state triggered a common concern especially among the educated classes who were already acquainted with emerging political ideas in the West in the aftermath of the French Revolution such as liberty, equality, and solidarity. The first Constitution was introduced in 1876 by Sultan Abdulhamit II under pressure from modernizing state elites, but it did not survive long. Therefore, the question of “what will happen to this country” has propelled the search for a better governmental system. The ensuing reform process did not save the Empire, and the Republican regime was established in the aftermath of the War of Independence in 1923. The founding leaders, Mustafa Kemal Atatürk and his close circle, were firm believers in the necessity of establishing a Western style nation state endowed with a modern governmental system. However, Turkey has not yet been able to reach a consensus about what institutions work best for ensuring political stability, efficient government, state authority, and economic development. In this regard, one can say that today’s public concerns and the long-term political agenda are not totally different from discussions of the Young Turks over a hundred years ago. A close observer of Turkish politics may argue, however, that the elements that constitute a true democratic constitution varies according to the different sectors of the society. There is a consensus on the need to change the introductory chapter (preface) since its spirit and wording are very militaristic and authoritarian. Consensus can also be reached regarding a redefinition of the fundamental rights and freedoms in the new constitution based on a somewhat more liberal understanding. Again there is a consensus that the new text must be short, concise, and flexible. Nevertheless, there are some issues that are more politically divisive. One has to do with the first three articles, which define the fundamental characteristics of the state such as republicanism, laicity, and official language. The main opposition CHP fiercely opposes any change to these clauses while Kurdish nationalists oppose a monolithic definition of Turkish as the official language, and finally the AK Party, although not opposed to these articles, demands the wording of the clauses be amended. In the relatively short period of the past ninety years in the post-Ottoman era, Turkey has had four different constitutions. An issue that may be even more divisive is the governmental structure of the new constitution. In the context of the discussion of the new Constitution, there seems to be two diverging views emerging in Turkish politics. One is the anti-presidentialism movement represented by the main opposition CHP in the parliament, and another is the pro-presidential group led by the ruling AK Party block. The CHP’s rejection is based on the principle that Turkish democratic culture and the people’s expectations since 1876 have been shaped by the parliamentary tradition, and thus there is no need to discuss a new system. Practically speaking, if the presidential system is implemented, the chance of a leftist candidate from the CHP being elected is relatively weak. Since 1950, the CHP has never been able to win enough votes to have a parliamentary majority. Historical election results show that right-wing parties in Turkey generally receive about 65 to 70 percent of the popular vote, while the left-wing parties consistently receive only about 30 to 35 percent. Therefore, CHP’s opposition to a presidential system is almost an ontological question. It does not want to come to the point where the party either has to redefine its ideology to win elections, as was the case with the UK Labor Party in the 1990s, or to risk becoming a perpetual loser in the presidential elections. The two remaining opposition parties, the Turkish Nationalist Movement Party (MHP) and the Kurdish Peoples’ Democratic Party (HDP) seem to be using more nuanced language in the current discussion. The MHP does not categorically oppose it simply because its founding father Alparslan Turkes openly supported the presidential system in the past and argued that it fit the historical Turkish tradition of governing better. The HDP has also, from time to time, stated that it may sympathize with the idea. However, its position is more about strategy than about principle. The HDP would like to use the new constitution-drafting process as an opportunity to promote its own priorities in Turkey such as redefining national identity, the official language clause, and obtaining new rights for regional autonomy in Kurdish populated areas. In the run-up to the August 2014 Presidential Election, HDP co-chair and party candidate Selahattin Demirtaş’s campaign slogan was “we will not let Erdogan become president” in this country. This slogan was designed to reach new segments of the society, especially those who hate Erdoğan in the far left of the political spectrum. The AK Party and its founding leader have consistently argued for the presidential system from the outset of its establishment in 2001. One can find it in the party program, web sites, and more importantly in the campaign promises in past elections. Coming from a conservative political tradition, the AK Party’s main argument for defending a presidential system is understandably political stability. Not surprisingly, the same argument was used in the past by other right-wing political leaders such as Necmettin Erbakan, Alparslan Turkes, Turgut Özal, and Süleyman Demirel. Indeed, Turkey has been discussing the revision of its political system for a long time, and among the most pressing needs related to systematic change is political stability. Turkey’s high growth rates in the past were achieved only with a stable domestic environment provided by strong single party governments. The party leadership believes that Turkey’s further development, and its desire to become an independent and powerful actor in the international arena all hinge on protecting political stability at home within a democratic framework. The single party system between 1923 and 1950, and the recurring military coups in later years taught Turkey a lesson: undemocratic practices will no longer be a viable alternative nor a desired means for achieving peace and stability in the country. As a result, Turkey must seek its stability within the confines of the rule of law, democratic legitimacy, and a transparent and efficient governmental system. The only available democratic model that will achieve this seems to be a presidential democracy with proven constitutional checks and balances. The current constitution [of 1982] and its governmental system have been harshly criticized, and more than half of its articles have been amended. Unfortunately, attempts to change the Constitution and institute a Presidential system have so far failed. Ever since the 1950s, there have been other dynamic political forces which have prevented previous parliaments from passing laws regarding changes in the Constitution despite the fact that Turkey has been led by right wing governments. The result has been that talk of a new presidential system has never gained much traction. Today, as a result of weakened military power, the AK Party is putting the issue back on the political agenda because the military has been weakened. The growing support of 70 to 80 percent of the Turkish population for a new constitution puts further pressure on all the parties in parliament, and this pressure cannot be resisted in the long term. In the aftermath of the 2011 General Election, the Turkish Parliament formed a Reconciliation on the Constitution Commission, which over the span of four years heard feedback from different constituencies about what they want in a new constitution. The willing participation also indicates that there is a large demand for a new constitution to be formulated by the Turkish Parliament. Finally, in the November 1 election, the AK Party campaigned on a promise to introduce a new constitution and implement a presidential system. It gained almost half of the popular vote. This is a message that the Turkish Parliament cannot avoid discussing anymore. However, there are two major challenges facing the AK Party in its aim to establish a presidential system. 1) The election on 1 November 2015 left the AK Party with a total of 317 representatives. This is less than the 330 members required to change the Constitution. Due to this numerical handicap, the AK Party has no choice but to look for support from other political parties. 2) The AK Party narrative aimed at garnering sufficient support from the general public must be convincing enough to assure its constituents and others that the parliamentary system is outdated and that the presidential system will offer a better future with more political stability. The fact that Erdoğan has won eleven elections in the past proves there is public trust for a leader like himself. Erdoğan is a great political communicator who believes that he will eventually persuade the public through discourse. For Erdoğan and the AK Party, it is a new target to be achieved as well as an item on the agenda for reform. That is what politics is all about – leading the public and surviving in a politically competitive environment. Indeed, this is what the Turkish opposition parties, especially the CHP always seem to be lacking in the eyes of the public. They are lagging behind when it comes to setting the agenda and they are failing to represent reform in Turkish politics. 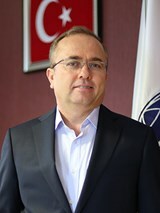 Prof. Dr. Birol Akgün is the Chairman of the Institute of Strategic Thinking (SDE) in Ankara, Turkey.